The biggest questions gym fans have been asking in the weeks — and now days! — leading up to World Championships are about where we think their favorite teams will end up. On the podium? In the top eight? Will they even be one of the top 24 to make it to next year’s World Championships? Joe Rinaldi, number cruncher for The Gymternet, compiled a list of teams who have competed recently — i.e. over the past six months — to see where each one stacks up. We know, we know — home scoring! You can’t compare scores across competitions! But so and so fell at that competition and she DEFINITELY won’t fall at Worlds! Yeah, we get it, but it’s always fun to see how things look, right? We took score data from every high-level team competition and national championship held between March and the present day and averaged them. For national championship meets, we used the top four scores produced by World team members for that country. Then we ranked each team, and instead of comparing scores to the Worlds team finals in 2010 and 2011 and to the Olympic team finals in 2012, we compared rankings. I don’t think it has to be said, but you never know — don’t take this as a super scientific prediction. Obviously things have changed for many teams: for example, no teams are the same as they’ve been since European Championships, Maggie Nichols had a score or two in the top three at U.S. Championships but then got injured, and Japan used an entirely different team for Asian Games than they’ll use for Worlds. Don’t worry…we took all of this into consideration to make it as accurate as possible. We also have to take into account that many of the scores here are from five member teams competing in 5 up, 4 count situations. With six member teams competing in the same format, the potential for some nations will grow quite a bit. First off, what’s so important about the team competition this year? Yeah, sure, eight make it into team finals, but who cares about the other 31, right? WRONG. In order to compete as a team in 2015, you have to qualify this year! Only 24 teams will qualify to compete in 2015, meaning 15 nations will only be able to send individuals next year. For a lot of teams that did not send a full team in 2010 or for teams moving on up in the gym world, this is a huge deal. There are 39 potential teams at this year’s Worlds vying for 24 spots for 2015 Worlds. In 2010, there were 34 teams. The top 24 teams in 2010 are all returning with full teams this year (with the exception of Slovenia, who replaced Poland at the 2011 World Championships). Six full teams who competed in 2010 do not have teams this year. Two of those six (Israel and Slovenia) are not attending Worlds this year with any gymnasts. There are 11 new full teams who did not compete as a team 2010. Those are: Argentina, Azerbaijan, Chile, Egypt, India, Ireland, New Zealand, Peru, North Korea, Sweden, and Taipei. * For Ireland, Greece, and Ukraine, we only had data for three scores instead of four, so we averaged their event scores and added on to the score they actually received. For example, if a team received a 30 for three routines, their average was 10, so we added 10 to their score. DNC = “did not compete” meaning the team did not field a full team in 2010, eliminating them for team competition later in the quad. Rankings were determined by team final spot for all teams that made finals each year; for teams that did not make finals each year, rankings were determined by qualifications. Competitions used include the African Championships, Asian Games, Australian Championships, Bosphorus Tournament, British Championships, Canadian Championships, Commonwealth Games, European Championships, Hungarian Championships, Hungarian Grand Prix, Japanese Championships, Jesolo, Landerkampf Kunstturnen, Novara Cup, Pacific Rim Championships, Pan Ams, Recontre Internationale, Russian Cup, and U.S. Championships. I think most predictions have the USA, China, Russia, Romania, Italy, Japan, Germany, and Great Britain as the eight teams with the best shot at finals…and our chart follows suit. That’s not to say it’s not without surprise, however…look at Romania all the way down at number eight! They did count a couple of falls at their recent meet in Switzerland, but the problem goes much deeper — the only remaining athlete from the 2012 bronze upset over China is Larisa Iordache. The rest of the team has some talent but nowhere near the level of the retired/injured Olympians, as they have very little depth in their pool, especially with Diana Bulimar’s injury. The problem is relatively short term, as the crop of juniors rising into the senior ranks next year will help immensely, but for now even if they hit all routines I think another squad or two might be able to sneak into the Big Four. Throwing it back to World War II, the Axis Powers are the ones to watch. That’s right…Japan, Italy, and Germany all have awesome scoring potential this year. It won’t be quite enough to knock Russia off the podium just yet, but all three have looked fantastic this summer, even with Germany swiping several athletes from their roster due to injury. Of these three, Italy is strongest; I’ve never seen them look so clean, so solid, and so ready to attack. They have a great crop of young seniors in addition to mainstays like Ferrari, Fasana, and Campana, and don’t have a single bad event. However, while they have more of a standout performance overall than Germany (where bars are the only “must watch”) and Japan, the three teams are so neck-in-neck, it would take little more than a step out of bounds on floor to derail any of the three. That’s also not to say that Great Britain or Romania are totally out. Neither are so far behind that they can’t overcome falls or mistakes that happened over the summer. Basically, the battle for the 4th through 8th spots is going to be an epic one, like one we haven’t seen in years. What about the top? I’d say the United States and China are pretty secure in the first two podium spots. China has looked fierce at the Asian Games, but the USA has more difficulty and a generally more consistent team, even with a relatively young crop of girls. Russia has slashed gymnast after gymnast from their lineup; losing Paseka hurts them the most, especially on vault, so I don’t think they’ll be able to catch up to China, but they’d have to really implode to miss the podium in Nanning. It’s nice to see Brazil on the periphery of the top eight, though I’m not sure they have the scores to make it in as a team just yet; same goes for Canada and Australia, who are both on the downswing at the moment. Brazil and Australia are both relying far too much on older athletes who just don’t compete the way they used to, while Canada has the opposite problem – they have a super young, super inexperienced team who missed out on what should have been an easy team medal at the Commonwealth Games. It’s always nice to see a team move up in the world, and a bunch of teams have improved their scores by a ton since 2010. One of the most significant ranking jumps is Hungary, from 23rd in 2010 to 18th on our chart. Young senior Noemi Makra joins Olympian Dorina Boczogo in improving on their status, and they should qualify to next year’s team competition without much stress. Colombia also had a huge jump, from 34th to 22nd; they’ll have more of a fight to make it in next year, but 12 spots in four years is awesome. Similarly, the Czech Republic moved from 30th to 24th, putting them right on the edge of potentially qualifying, though they’ll also need to fight. Unfortunately, falls have to happen to make these jumps possible, and France faced one of the largest falls, from a steady 10th-11th in the previous quad all the way down to number 20, putting them as a danger zone team when considering next year. Poland also fell, from 17th to 26th, making their situation precarious as well…and though Greece and the Ukraine both had ginormous falls, it could be partly due to the fact that we didn’t have full data and had to work averages in. It’s possible neither fell as dramatically as it looks, so for these two we’ll have to wait and see. North Korea, infamously banned from competition in the previous quad due to age falsifications, is BACK and hovering around 12th place, which is an excellent position for them. They won’t make team finals this year but have plenty of time to build on their already solid foundation. Other ‘new’ teams that look strong are Sweden and New Zealand; Sweden at full force looks stronger than other more established teams, yet they won’t be much of a threat this year. New Zealand is currently ranked 25th in our prediction survey, meaning they will be under a lot of pressure to hit. 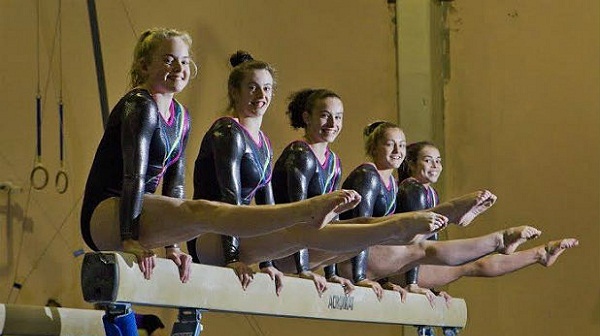 New Zealand gymnastics is in a major renaissance period at the moment, so it’s crucial for them to qualify a full team to Glasgow. Their score potential could be quite a bit larger than it looks here, if only because when they competed at the Commonwealth Games, they lost so many members to injury. With a squad of six, hopefully all looking healthy, they can definitely improve on their performance overall to fight for a top 24 spot. Data fun 🙂 Is the pic of the New Zealand team? Germany and the UK appear to be out of order. Brazil had a few mistakes on the Panam, and weaker vault ( mostly due to errors). I’m very curious to see what their routines will be like. Some of the new girls do have a lot of potential on improving their vaults, mostly to DTY ( some of them used to compete them farily easy at an younger age, such as Mariana Oliveira. I don’t believe they will outscore USA on floor and beam like they did at Panams. UB as usual will be very bad scoring. Talking about USA, i finally really really enjoy ashton UB routine, she has real worldwide top routine. Thought GB would rank higher, will be interesting. Hope Downie hits, and frags make it to floor finals. If only China, could put on a strong set on FX, that battle would be excited. I feel very bad not seeing Cuba doing worlds, they are extremely charming, and amazing athletes. I have a feeling that this worlds won’t be as predictable as we are all expecting. PLEASE let New Zealand qualify a team for next year!! I’m hoping so badly they can get a team to Rio (however unlikely that may be)! Very interesting to see Japan at number four. This goes to hoping that Belgium can qualify a team to the Olympics! They missed it by 1.122 at the test event in 2012 and they are now more than ever determined to do it! I Agree, I would love to see the NZ team qualify for 2015 worlds and see Millie Williamson compete first year senior! She was shy by one spot at the Youth Olympic games this year for the AA! After the qualification rounds are done, can there be some sort of comparative article seeing how these mathematical predictions stack up? I would find it so fascinating! But then again I’m a nerd. Yes! We’d love to do it.